Libbie S. Mastny, 94, widow of Milo Mastny, died Tuesday, November 20, 2018, at the Clarkson Community Care Center in Clarkson. Funeral Service Monday, November 26, 2018 11:00 A.M.
Libbie was born May 19, 1924, on the home place north of Leigh, to James and Anna (Kyncl) Stepan. She attended country schools near Leigh. While working at the Top Notch Cafe in Schuyler, Libbie met the love of her life, Milo Mastny. On September 23, 1948, they were united in marriage at Zion Presbyterian Church in Clarkson. They were married for 64 years when Milo died in 2012. They lived and farmed near Schuyler until retiring in 1986. They were honored in 2004 for the farm being in the family for 100 years. Libbie was a homemaker and full time housewife. She loved to cook and bake and was noted for her "fresh" bakery at harvest time and her famous "ranger cookies". She and Milo loved to dance and followed the Bob Blecka Band wherever they played. 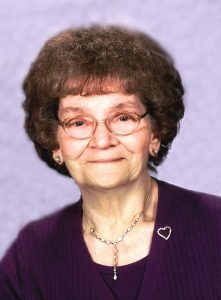 Libbie was a charter member of the Schuyler Hospital auxiliary and belonged to the Together Club, Presbyterian Friendship Circle and the VFW Auxiliary since 1949. She was a 70 year member of the First Presbyterian Church. Libbie is survived by her two sons; Eugene (Joyce) Mastny of Fremont and Jim (Rae Ann) Mastny of Dwight, one sister, Elsie Jonas of Clarkson, five grandchildren; Chad, Rebecca, J.J. and Allie, Sarah and Christopher and three great-grandchildren; Reagan, Tyler and Miles. She was preceded in death by her parents, James and Anna Stepan, husband Milo, brother Jim, sister Addy Briggs, grandson Curtis Mastny, sister-in-law Ann Stepen and brother-in-laws Lloyd Budin, Alvin Jonas, and Cy Briggs.